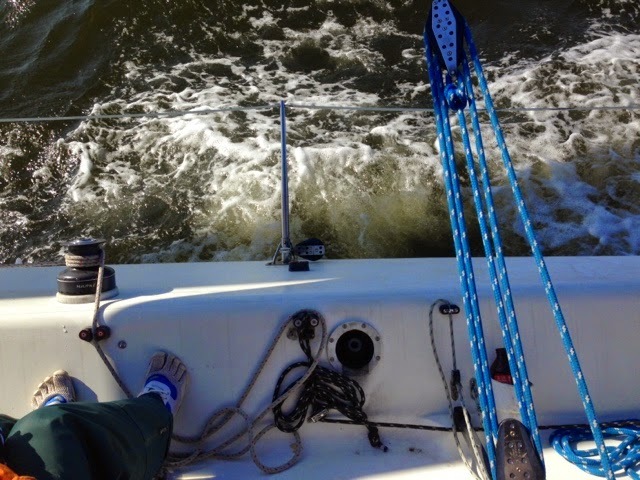 Sorry for the delay in posting... life has been hectic and I've been sailing upwind literally and figuratively. 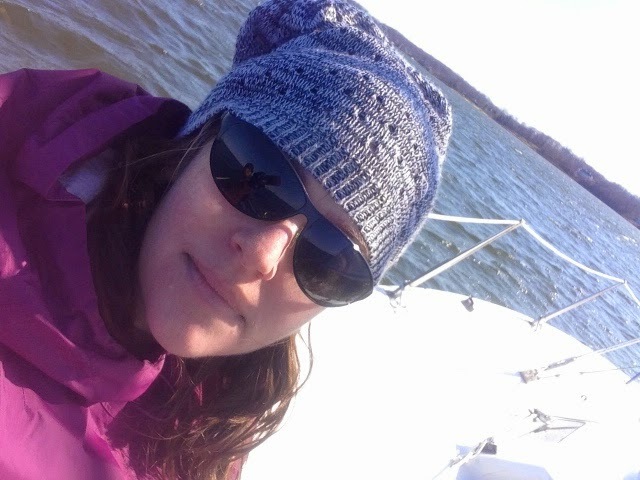 I managed to get out for a sail on Easter... not on my boat but on a J/80 at a local boating club where a friend I work with is a member. We headed out again a couple weeks later. The wind was very light at first but kicked up as the afternoon progressed. 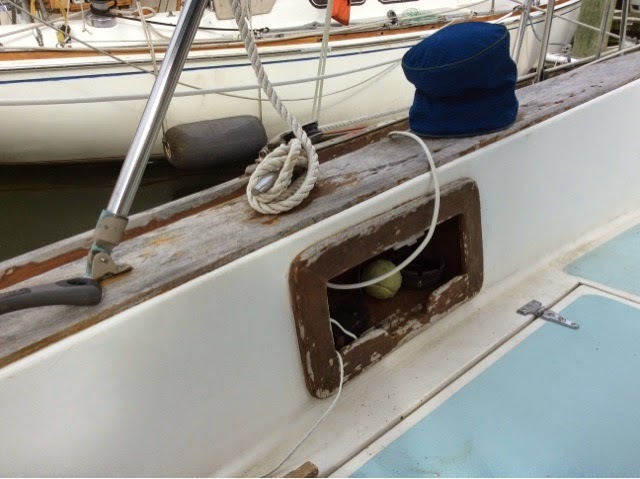 I only wrapped the jib sheet counterclockwise on the winch once. Doh! 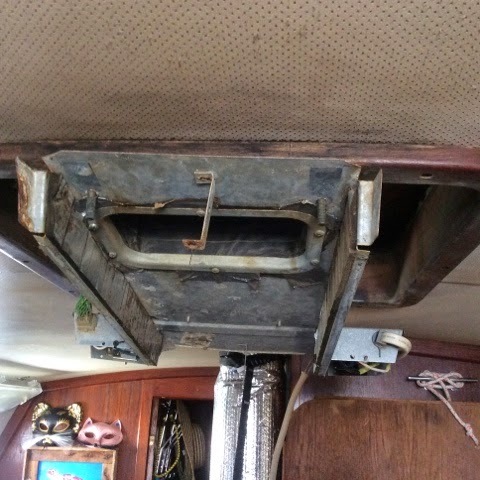 The big project I am thrilled about is the removal of the old RV HVAC unit from the cabin top. It was hideously ugly and so embarrassing. And I couldn't see over it when sailing. 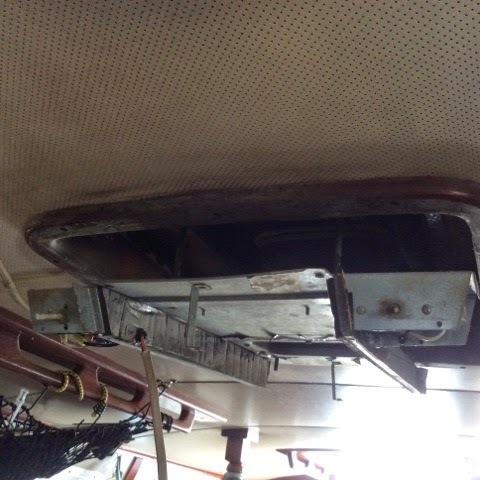 I can't afford the proper replacement hatch ($1049 for the Bomar 100 Series hatch on Defender), but I have a piece of plexiglass over the hatch as a temporary fix. The plexi didn't take well to the old 4200 we tried to use, but it isn't leaking and before I try again with black silicone I may see if someone can build a wooden hatch top without breaking the bank since the prior owners had left the old hatch bottom piece in place when they put in the air conditioner. Here are some photos of the old AC unit and my new temp plexi fix. Of course I am currently without air conditioning which will become intolerable for me and the pets in about a week. I'll likely have to spring a few hundred for a portable room air conditioner and figure out how to vent it out a hatch without letting rain in. 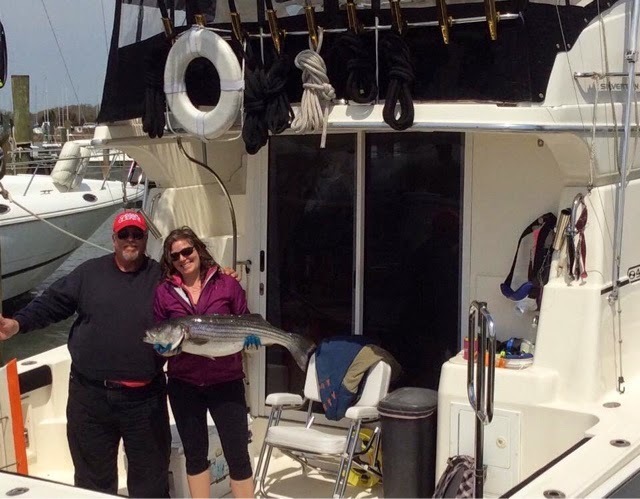 I also made it out fishing on the second day of trophy rockfish season. I caught the only fish of the day, a big girl just shy of 36". 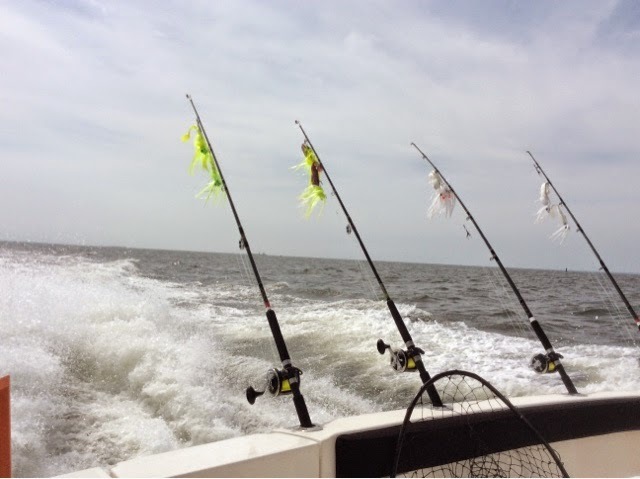 We ran 16 trolling lines, 14 off planer boards. For the fisherman: the keeper was caught on a white parachute on a tandem rig. I caught up with one of the charter captains from that marina and gave him my card. Lo and behold he called me a few days later asking if I could work charters this Monday, Tuesday, and Wednesday, but I had just picked up a project in DC and had to decline. 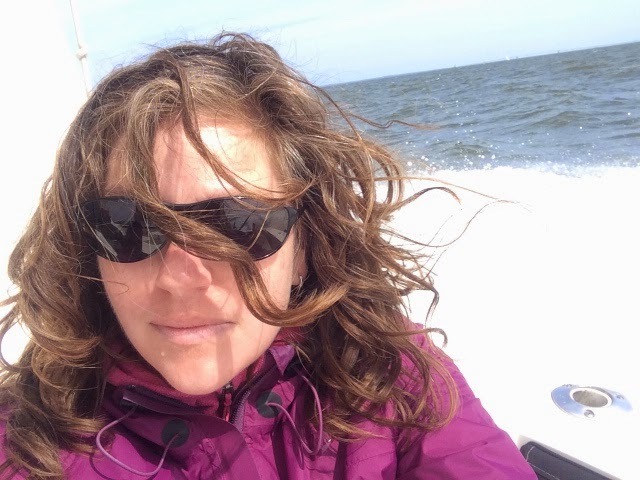 I was definitely disappointed to turn down the chance to go out on another boat since every captain does things differently, which is a great chance to learn. And getting paid to spend the day on the water fishing is never a bad thing. Hopefully I will be able to sync up with him at some point this season when I am between DC gigs. The next project I began tackling was stripping the chipped, yellowed old Cetol off the teak. I hate the look of it and that it is all chipped and peeling makes the boat look shabby. It will be a labor-intensive, time-consuming job, but if I can knock out little sections for a couple of hours here and there I'll eventually get it all off and be able to start lightly sanding and then sealing the teak. 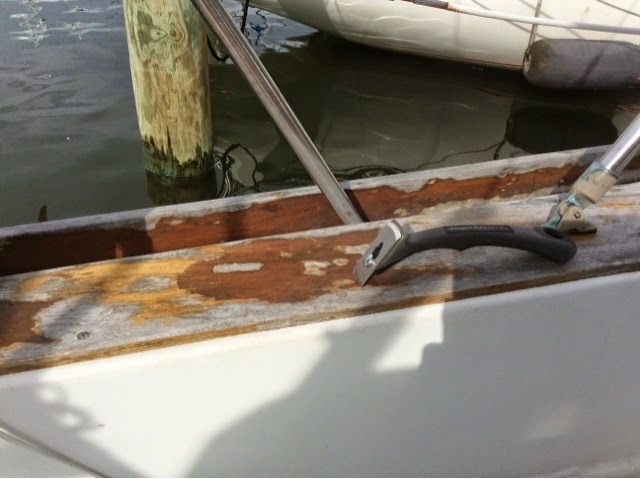 I definitely do not see varnish fitting into my lackidaisical lifestyle and I actually like the soft gray of weathered teak, so I am thinking about using clear Semco sealant to give the teak some protection without changing the color. We'll see; I was all psyched up to knock it all out quickly since I wasn't expecting any projects in DC until mid-May, but I just picked up a small project and with the cost of all the boat projects I can't afford to turn it down. This past Saturday I had my old batteries removed and new ones delivered. It was so worth paying for a couple of young guys to deal with removing the huge, heavy 4Ds! I was definitely maxed out lifting the new 6V batteries that are going in and those only weigh 64 pounds each. 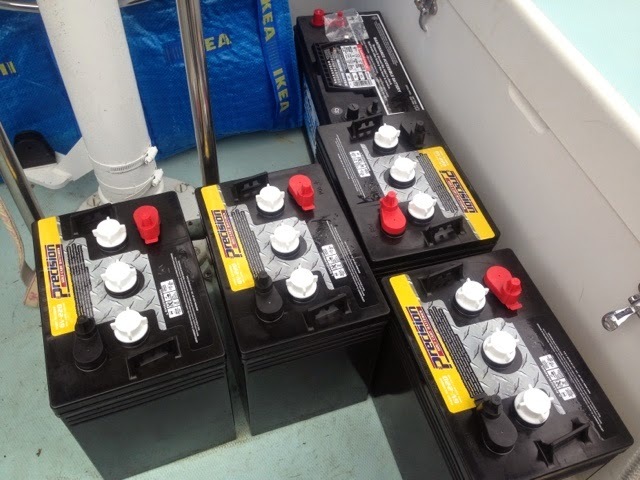 The battery box needs some work and the water pump is (crazily) installed right on top of the batteries, so my friend doing the install just hooked up two of the 6V batteries and the new group 31 dual purpose (i.e., high cold cracking amp and deep cycle) starting battery. 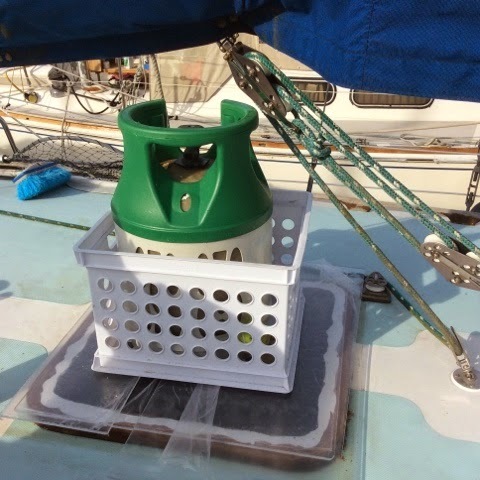 We'll relocate the water pump, fix up the box, figure out a good strap system to keep the batteries from sliding around when sailing, and set the bank up properly. The four 220AH 6Vs will be two series that are then paralleled together to make one bank with 440 12V amp hours. 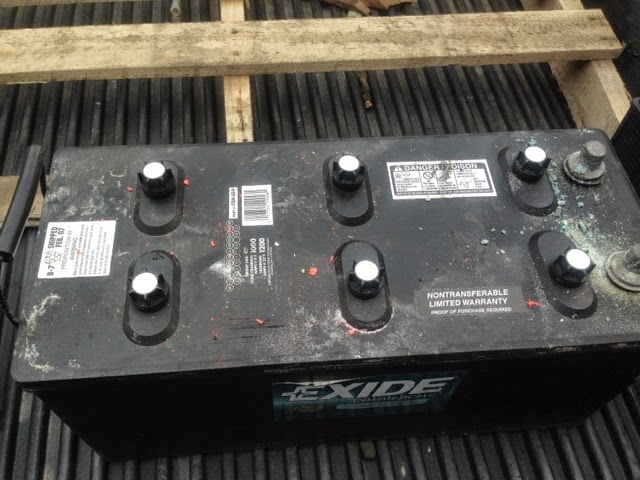 Knowing it is bad for batteries to ever be drawn down more than 50 percent, that gives me a maximum electrical budget of 220 amp hours before charging, but I will try to avoid ever cycling them down that far. My single biggest electrical draw (outside of heat or air conditioning, which are only possible when hooked up to shore power anyway) is my 12V fridge, which draws 5 amps when running. In the heat of summer that could add up to as much as 120AH if the reefer is going 24/7. Power management is probably the hardest thing for people to adjust to moving aboard and so critical. Luckily I went into the process knowing that and never buy any electrical appliance without asking how many amps it draws (which always raises eyebrows with non-boaters). Here's a photo of one of the old 4Ds and then my shiny new batteries. The battery replacement project was primarily driven by the need to get the engine to start. Unfortunately, when I tried to start her up yesterday it was the same sad sound of the starter just not making anything happen. So now I've got another mystery to solve and project to tackle. I just want to get her out of the slip! It's incredibly frustrating being a dock queen when I want to get her out as much as possible. As usual, I either have the time to work on the boat but no money for parts and labor or I am making money but have no time to get to the projects. I'm just trying to find a balance and plow ahead to make progress as best I can. Yesterday I went to the spring sailboat show. It was the first show in Annapolis when I could actually buy something. Every other time I've gone I'm broke. I usually buy one overpriced Painkiller from Pusser's and a couple of sail ties. This time I could spend up to $200. I was hoping to find a nice pair of flip-flops and a good foulie jacket a little lighter weight than my offfshore one. But the spring show is just so small there aren't very many vendors. I also went with friends who are boat-shopping, so we spent most of the time climbing on used boats for sale. I don't normally look at any of the boats at the show since I already have a boat and seeing fancier ones just makes me feel bad. But going with a group makes it much more fun. So all I ended up spending was a $5 tip at the complimentary Paladar rum and food tent and $12 show ticket. Lots of projects ahead and an upside-down hectic life as usual, but I still wouldn't trade it for the world. Glad to hear you picked up some work and are making progress!!! Make sure you take some pictures of your smiling face once you get out of the slip again! I saw someone post a video the other day about a homemade air conditioner. Here is the link to it on youtube. Obviously it requires large chunks of ice...not sure how available that is to you at your location. I'm headed to Deale on Friday to look at a boat with a friend, then might head up to Annapolis for the evening for a few drinks...though the weather looks sketchy. I love this time of year! I will definitely post pictures when I get out of the slip. 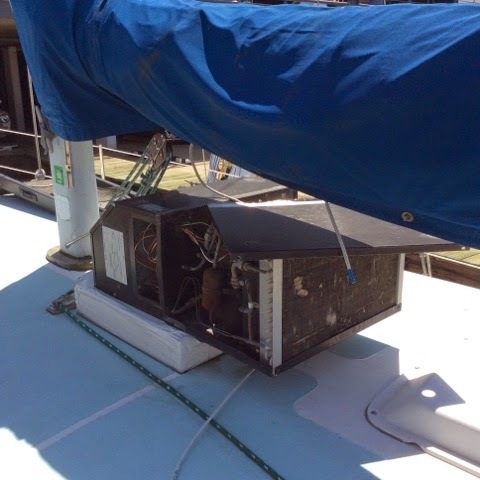 I was jumping up and down with joy just getting that old A/C off the boat! I could do a swamp cooler using block ice and a fan, but I'll probably spring for real A/C since it would also act as a dehumidifier--which will really help in our summers. Give a shout out if you're in the neighborhood! I will shoot you an email if we end up in Annapolis, or knock on your boat. I think I remember where you told me you moved your boat to. As a side note, sad story...the boat I prepped for cruising and then sold has met with disaster. The guy who bought it from me did his trip with his wife to the Bahamas, had a blast, then sold it to some old guy who recently crashed it on the beach in Florida!!! Google "vero beach sailboat crash"...it's sad to see it like that. There will be another boat for me in my future, just not sure when and what my current situation will be like. My life is crazy right now...just trying to keep my sanity. Wow; always sad to see a boat meet a bad ending. Hang in there! Every thing that goes wrong tests us and makes us stronger. I'll definitely be around Friday... might catch a show reggae at Union Jack's but Annapolis is itsy bitsy, nothing is far from from anything else. How have you been coming along with your battery replacements? Get the iron genny running?